Fill each day in just your own way - Maybe a family Wake 'n' Shake session to start with? 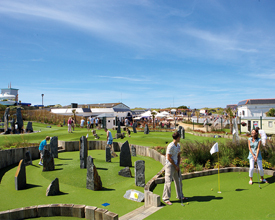 Followed by a morning in the indoor or outdoor pool complex with flume and terrace or enjoy a game of Adventure Golf. 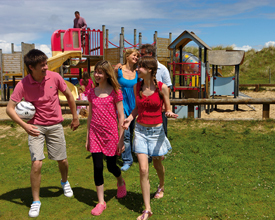 Perran Sands Holiday Park offers the following facilities. From Exeter take the A30 through Devon and Cornwall. 1 mile beyond the Wind Farm roundabout, turn right onto the B3285 towards Perranporth. Perran Sands Holiday Park is on the right before you go down the hill into Perranporth. 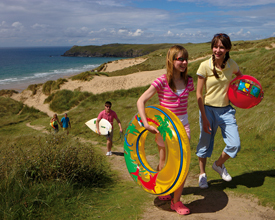 In Cornwall, holidays mean a friendly welcome and safe, sandy beaches - perfect for children. Step back in time to stone-built Cornish fishing harbours and leafy country lanes scented with honeysuckle. 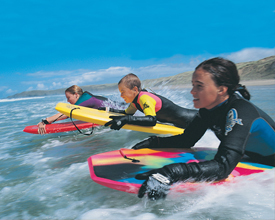 Some of Cornwall's best surfing, dune trekking, picnics and sandcastles can easily fill up your days. Newquay is the most popular holiday destination in Cornwall, with an outstanding range of sandy beaches and is the surf capital of the UK. 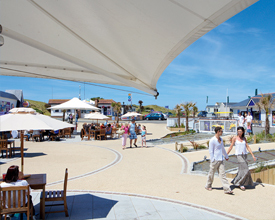 Also home to Waterworld filled with family fun, with tropical pool, 25m swimming pool, viewing gallery and cafe, licensed bar, garden, terrace, bandstand entertainment and the popular junior discos. Make the most of the fantastic local attractions including the Eden Project and mysterious Bodmin Moor. For the ultimate day-out, why not take the car to Land's End and fly to the sub-tropical paradise of St Mary's, Tresco and the other Scilly Isles? Alternatively, see Cornwall's most famous landmarks from a different angle, relaxing on a fully catered coastal cruise from Penzance. Our Chalet accommodation remains highly popular, especially with large and extended families. but some have stairs to bedrooms on an upper level. Modern and self-contained with extra space and privacy. Highly popular with large or extended families. relaxing carefree holiday. Pets welcome. Exclusive to Perran SandsAttractive, novel and traditional, the Mongolian Yurts are the world's oldest nomadic structures with the home comfort that you need. Enjoy the great outdoorsStay under canvas in complete comfort at Perran Sands for a unique camping experience. Our Super Tents are readily put up and fully equipped. Have you been to Perran Sands Holiday Park? Please submit your review so that others can benefit from your experience. Important note: Information provided here about Perran Sands Holiday Park is based on our best knowledge. However, please check with Perran Sands Holiday Park before booking to ensure that you have the information required. Reviews are the sole views of the contributor and do not necessarily represent the views of CampsitesandCaravanParks.com or Perran Sands Holiday Park.